Light that is so discrete you can barely see the light source can be termed dark light. So basically you can see the light but not the source unless you are standing directly under it looking up. Dark light sets a more natural mood because you cannot see the artificial light source, thereby creating unobtrusive lighting. Instead of having bright areas of light dominating a space, dark light luminaires can be used to create a discreet lighting setup where it is hard to notice where the light comes from. With discreet lighting, especially when indirect light is combined, it is possible to create a harmonious, natural lighting atmosphere. This is where dark light luminaires offer a perfect solution. The diagram below represents a typical field of vision. The central area represents the area where an image is at its sharpest to the eye. An average person has a horizontal peripheral vision of approximately 90 degrees. However vertical peripheral vision is less than 60 degrees. In the following diagram Person A cannot see the luminaire and therefore not the light source, so glare is not an issue. Person C is standing outside the beam of light i.e. beyond the dark limit, and cannot determine the light source even though he can see the luminaire. 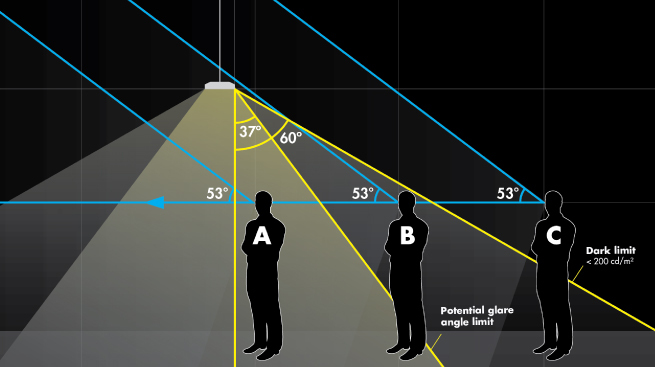 Person B can see the luminaire and he can see some mild light intensities given the light is limited to not cause glare above the potential glare angle limit. A luminaire can be classified as “dark light” only when it fulfills the requirements for dark limit, which means there must be less than 200 cd/lm2 above 60-degree viewing angle.